What pet insurance covers ? 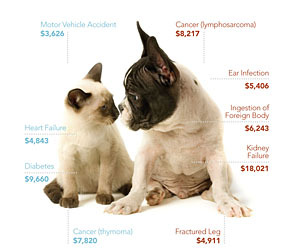 How much is pet insurance ? Is pet insurance worth it ? You love your pet, but if it were to get seriously ill or injured, you probably haven’t saved the money to pay for its care. Sure, an emergency fund to cover pet expenses sounds like a great idea. But if you’re honest, paying a pet health insurance premium is more likely to happen than promising yourself you’ll save into a pet emergency fund. And you do need an emergency fund of some kind. All the same, if you’re considering veterinary pet insurance, don’t sign up until you know all of the facts. Comparing it to your own health coverage isn’t that enlightening. Petplan pet insurance functions more like property insurance. Paying more for human health insurance generally gets you lower deductibles and higher percentages of your healthcare bills covered. With pet life insurance, paying more also gets lower deductibles, but what you’re buying in addition is coverage for a wider range of illnesses and problems. Let’s check out what insurance for pets does and doesn’t cover. How coverage is structured ? Pet insurances often has multiple deductibles, one deductible per incident and an annual deductible. In our research, annual deductibles ranged from $100 to $250 per year. The higher your deductibles, the lower the payment so pick a deductible you can comfortably afford. Pet insurance companies structure their coverage in tiers, the higher you go, the more types of problems are included in coverage. Think about your pet’s general health and also whether its breed is subject to characteristic medical issues that could suggest you should purchase one of the higher tiers. Let’s compare two popular insurers. Veterinary pet insurance, better known as Vpi, has three tiers of pet insurance. Its injury plan covers injuries, but not illnesses. The medical plan, as Vpi calls it, covers basic coverage for accidents and illnesses, including cancer. Its major medical coverage has higher benefit allowances and covers limited hereditary conditions after the first year. All plans from this company cover accidents, x rays, surgeries and hospitalizations, but vary on how they cover other expenses. Only the major medical plan covers hereditary diseases, for example. Aspca vetinary pet insurance has three plans. Level 1 is the company’s basic plan : it covers injuries, including broken bones, swallowed objects, bite wounds and related diagnostic procedures. Level 2 adds certain illnesses, and level 3 adds coverage for some hereditary and congenital conditions, some alternative therapies and behavioral issues. Other companies have similar multi tiered plans. All top 10 pet insurance companies we reviewed allowed the owner to pick their vet providing the practitioner was licensed. Most plans came with some amount of preventative care coverage or offered a rider that included it. Co pays ranged from none to 30%, and monthly premiums were between $59 and $168 for a medium sized dog living in California. Obviously, low cost pet insurance vary based on age, breed, where the animal lives and other qualifiers. Before signing up for vip pet insurance, consider the costs closely and also a pet insurance comparison chart. According to a report by Consumer reports, pet insurance didn’t pay for itself for most pet owners. And pay careful attention to the terms of the policies. Pet insurance policies have waiting periods before certain parts of the plan go into effect. Waiting periods of 24 hours for accident insurance, 14 days for illness coverage and up to one year for certain conditions, such as hip dysplasia, are common. Also read carefully the rules for pre existing conditions. Policies limit or provide no coverage for pre existing conditions. If your animal coughs, for example, some companies may try to limit coverage on any condition that has a cough as one of its symptoms. Ask the insurance company to clarify how it defines pre existing conditions, and make sure the language in your policy supports what you the representative told you. Read it over carefully and call the representative before signing up if there’s a discrepancy. Insurance companies exist to make money. Your top pet insurance rates may change, the insurer may send notices of changes to your policy coverage without providing it to you in plain English, and it may resist paying claims, especially if they are for high dollar amounts. Call the customer service number and ask questions when you get something you don’t understand or a ruling that you dispute. Know your policy inside and out before you sign up and always do some pet insurance comparison review before agreeing to any veterinary services. That’s another time to check with my pet insurance customer service.